Most people today have a much better understanding of what it means to take care of the local environment. Using less, saving more, reusing items and recycling are all just a part of our daily lives in Southeastern Massachusetts. However, while you already be recycling in Marion or using less water in Acushnet, there is still much more you can do on a larger scale to help reduce the amount of waste in our local landfills. 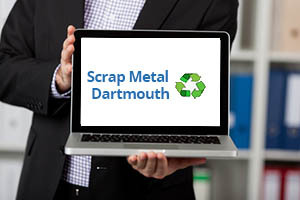 Beyond saving the planet, the purpose of this article is to talk about another meaning behind the phrase “going green” – that is, learning how to make money from scrap metal recycling in Dartmouth and all across the south coast region. You can make a little coin by collecting and recycling glass bottles, but the real money is in recycling scrap metal for cash. This is what is known as a “win-win” situation because you are making money and helping to keep New England clean at the same time. Scrap metal is everywhere and in many cases it just gets discarded or thrown out with the trash. There’s money to be made if you know where to look and you take some time to educate yourself on which types of metal are most worth your while. Recycling is good and everyone should do it, but there’s much more that can be done on a much larger scale. Statistics show that each year, literal tons of scrap metal will end up in our landfills or will get sent off to a recycling facility that is simply not able to maximize the use of that scrap metal. In order to make the biggest impact, it is important to bring your scrap metal to the right place. We are fortunate in the south coast area to have access to Mid-City Scrap Iron & Salvage, a family owned and operated scrap metal recycling company that has been in business since the 1930s. Not only will you get the best prices for scrap metal in Westport when you visit their location, but they are also a full service scrap metal processing business. Mid-City uses the latest equipment and state-of-the-art technology to process scrap more effectively to turn it into high-quality end products that can be melted down and used by manufacturing companies and other industries to make brand new products. As a result, you get paid more for scrap metal at Mid-City than you would at a generic recycling business because they get more out of each piece of metal you recycle. Once you’ve cleaned out your garage, your basement and your storage shed of all the scrap metal that’s been lying around, what can you do next to continue recycling scrap metal for cash? There are plenty of places and ways to get your hands on more scrap metal recycling in Dartmouth and all around Southeastern Massachusetts – if you know where to look. What is scrap metal? What kinds of things can you recycle? Aluminum and copper are the most profitable and learning where to find these metals can help you to get paid more for scrap metal in the long run. Old washing machines, old car parts, old air conditioners and other appliances all contain scrap metals that can be recycled for cash. One way to get started is to speak with the people you know about any scrap metal they may have lying around in their garages, basements and storage sheds. Offer to pick up and take their scrap to Mid-City Scrap for them. Most will appreciate the gesture and will remember to call you again in the future if they have any bulk items that need to be removed. Setting up a rapport or a reputation, if you will, as someone who is willing to take these items in for recycling will help you get lots of scrap metal in the future. Contact local businesses that work with a lot of metals, such as home repair contractors or car repair shops. These businesses often get piles of scrap metal waste that they don’t know what to do with or don’t have time to haul off on their own. Again, build a rapport with them and let them know that you are willing to take those items off their hands and you’ll have a steady stream of business coming in before you know it. Thanks to the Internet, you can now post ads for free on websites such as Craigslist.org and offer to pick up old appliances or other scrap metal recycling in Dartmouth, Fall River, New Bedford, Acushnet, Freetown or anywhere else you are willing to drive to do more recycling scrap metal for cash. Since Mid-City is centrally located, you’ll be able to easily pick up items all over the south coast area and then take them to get the best prices for scrap metal in Westport without having to go too far out of your way. You can also post notices on bulletin boards or anywhere else that you are able to reach out to more people in the surrounding area. To find out more about Mid-City Scrap Iron & Salvage, visit their website, call or visit them in person in Westport on State Road. Current market prices for ferrous and non-ferrous metals are available to help you get the best prices for scrap metal in Westport or anywhere else in Southeastern Massachusetts.